From this December 2014 LCV speech (17 min mark). President Obama and I went to the global climate conference in Copenhagen in 2009. We ran into a solid wall of opposition from countries like China, India, and Brazil. The president and I literally had to crash a secret meeting between them to force real negotiations. We marched right by startled Chinese security officials. I had to duck under their outstretched arms. We got into the room--you should have seen the looks on the leaders' faces because they'd been dodging us all day and the president said wow, we've been looking for you. Persistence paid off..we did hammer out an agreement..
Hilary Clinton, is a deluded fantasist, telling lies comes all too easily with this woman. One recalls the story, she so glibly related about her being shot at on the tarmac of some Sarajevo airport, it was proved to be a total fabrication. As will this latest made up tale of her derring do - "sorting out China" - indeed and well see wont we, God help America. And if she won, sorting out China, India, and the like, why we get to live in energy poverty, shivering in the cold and dank under lighting fit for a Soviet prison hallway. For five times the price. Copenhagen was asuccess? Matter of interpretation perhaps, many see it as marking the start of the decline of the whole farago. Many still clutching to its revenue streams though. May I draw EVERYONE'S attention to the important comment ..
EVERYTHING YOU NEED TO KNOW ABOUT CONVECTION BUT WERE AFRAID TO ASK. The guards keeping her out of that brave meeting were actually the snipers that were shooting at her back in her Bosnian campaign, when Brian Williams saved her life. British Government Member of Parliament, David "Top Cat"
FATALIST DEPOPULATOR pope cannot even fix a Naples evacuation drill around Vesuvius, and he will survive a global revolt if we don't avert the expected electro-volcanic glacials? Did she crash the Chinese party under sniper fire? Oh well, at this pont what difference does it make? You are pretty quiet lately. I asked you back when you started the anti-science binge if you were making a good decision, you blew me off. I thought you were a smart guy. Perhaps you've been getting paid all this time. But now . . . not much more to say? Tired of being completely wrong? Yes, there are climate alarmists, they are easy to take shots at. But the underlying situation (despite your title, increase in CO2, which is a GREENHOUSE GAS, which CAPTURES HEAT) is very real, and getting much worse. And your efforts have increased the prospects for damage. Just wondering, you always seemed like a thoughtful individual. Ever have second thoughts about this? we ask all public and private sectors for a GLOBAL DRILL and disconnection of all transformers and devices from the electric grids, so that humanity will be ready, when the satellites alert in time for the next super-storm. What correct physics is telling us is explained here where you are invited to make a submission for a reward of several thousand dollars if you can prove the thermodynamics wrong and produce a study showing opposite results to mine which showed that more moist regions have both lower daily maximum and minimum temperatures than drier regions at similar latitude and altitude. Q.1: What is the sensitivity for each 1% of water vapor in the atmosphere? Q.2: Based on your answer to Q.1, how much warming does a mean of 1.25% of water vapor produce? Q.3: Also based on the above, how much hotter should be a rain forest with 4% WV compared with a dry region with 1% WV? Q.4: Taking into account the fact that solar radiation reaching Earth's surface ranges between zero and about 1,000W/m^2 with a mean between 160 and 170W/m^2 and that radiation from the colder atmosphere is known not to penetrate water more than a few nanometers (thus unable to "warm" it) explain, using the Stefan Boltzmann equation and a typical range of flux between 0 and 1,000W/m^2 how the ocean surface reaches observed temperatures. For answers, study the new 21st century paradigm shift in climate change science which will be widely publicized in 2017 and common knowledge by 2025 whilst the current hiatus continues until about 2028 to 2030. Long-term (500 year) natural cooling will start before 2100 and mean temperatures will not rise more than about 0.4 to 0.6 degree before the cooling starts, as shown here. Who's next to take me on? It is obvious to any physicist that the greenhouse conjecture is false, because the direct solar radiation reaching the surface is less than a third of what would be required to explain observed surface temperatures. James Hansen noted this apparent discrepancy and, not realizing that the rest of the required thermal energy is in fact supplied during the day by non-radiative processes, he wrongly assumed that radiation from the cold atmosphere could be added to solar radiation and the total used in Stefan-Boltzmann calculations. But even the net of 390W/m^2 which included the back radiation would not be enough because it is variable flux and can thus only achieve a mean temperature much closer to freezing point. He really needed over 450W/m^2 but glossed over that fact and “taught” the world of climatology the totally incorrect physics based on compounding the radiation from two effectively sub-zero sources and assuming that the sum “explained” observations. Now, most of the atmospheric radiation comes from the most prolific “greenhouse” gas, water vapor which is claimed to cause warming, though evidence suggests the opposite. So where did it all go so wrong? Hansen incorrectly assumed that, without IR-active greenhouse gases, the temperatures in the troposphere would be isothermal. That is not what the Second Law of Thermodynamics tells us, because it says entropy will be a maximum, not temperatures equal. Every vortex cooling tube in the world demonstrates how a force field (like gravity or centrifugal force) sets up a radial temperature gradient as that force acts on molecules in flight between collisions. 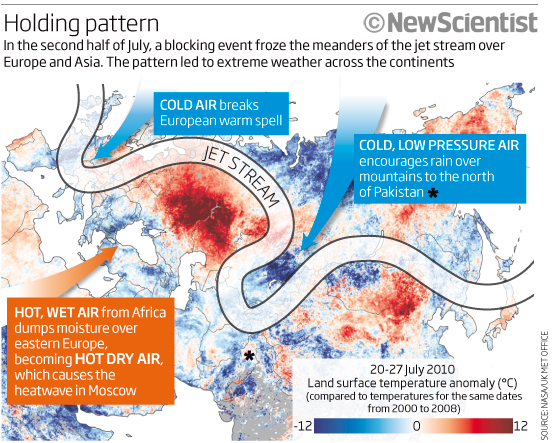 The “lapse rate” (climatology speak for temperature gradient) is not due to imaginary “parcels” of air rising, expanding and cooling, because there is nothing to hold any such parcels together as the molecules move randomly between collisions at speeds of about 1,800 Km/hour. This temperature gradient evolves at the molecular level in accord with the process of maximum entropy production, and that state of maximum entropy is reached when there are no remaining unbalanced energy potentials. That means that the sum of mean molecular gravitational potential energy and kinetic energy is homogeneous, and so there is a temperature gradient. Once we understand that the temperature gradient is what physicists call the state of thermodynamic equilibrium, then everything falls into place. We can deduce quite simply that new solar energy absorbed in the stratosphere and upper atmosphere each morning will disturb the equilibrium and it can only be restored by downward non-radiative heat transfers, these being the real source of the missing energy Hansen tried to explain with back radiation. So, in fact, temperatures in a planetary system build up from anchoring layers in the upper troposphere and above, all the way to the core, because the temperature gradient, forming at the molecular level, can be calculated and shown to occur in solids, liquids and gases. It forms by a slow process which can be over-ridden, and is, in the oceans and the stratosphere, but, in general, it dominates. It is observed in all planetary tropospheres, and so the probability of this “heat creep” hypothesis being wrong is millions to one against. DR HANS JELBRING CRITICIZES PSI SLAYERS and RESIGNS, RECOMMENDING that DOUG COTTON BE HEEDED. "The essence of science is to be able to have a discourse and discuss pro and cons about hypotheses and theories especially if you claim that the organization you represent has the intention to reach a standard that is at a scientific level. I have found that leading members of PSI show little will to discuss scientific matters and to leave out personal emotions making it close to impossible to have a meaningful dialog. "Doug Cotton might behave in a miserable way showing his anger towards certain scientists and PSI. Still, the book he has published contains many arguments which deserve a serious and thorough investigation. This is why I have recommended a number of Australian politicians to read what he writes. Much of it is essential in the debate of the IPCC false claims and even the future economies of western countries and even more. " THE SUN'S DIRECT RADIATION CANNOT EXPLAIN SURFACE TEMPERATURES. You can't assume (like Postma and Bright-Paul) that the mean of 168W/m^2 could produce a mean temperature above 233K (-40°C) just because the radiation is variable and can reach over 1,000W/m^2 for a very small portion of Earth's surface. The variability actually leads to a LOWER mean temperature than that for steady flux. How would you explain Venus surface temperatures with your conjecture anyway? IT’S ABOUT TIME all you CLAUSIUS FANS got it into your heads that (for NON-RADIATIVE HEAT) the Clausius corollary of the Second Law* only applies in a horizontal plane wherein gravitational potential energy does not change and thus does not affect entropy. THIS IS OVERWHELMINGLY IMPORTANT IN REGARD TO PLANETARY TEMPERATURES. It is NOT radiation that supplies all the necessary thermal energy to maintain a planet's surface temperature - it is free (or "natural") convective heat transfer happening at the molecular level and carrying out the SECOND LAW* process of MAXIMUM ENTROPY PRODUCTION. But you will need to study my paper that arrogant people at PSI rejected in 2013. * Second law of thermodynamics: “In a natural thermodynamic process, the sum of the entropies of the interacting thermodynamic systems increases.” There's nothing in there about heat from hot to cold. She said: "...I had to duck under their outstretched arms...."
" Persistence paid off..we did hammer out an agreement.."
translation: "I got well later when those countries "donated" hundreds of millions to my "foundation".